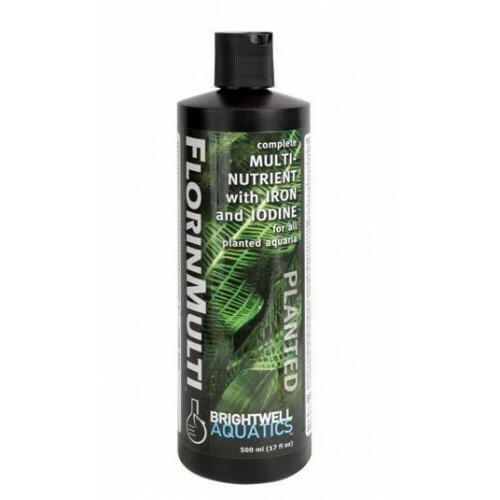 Provides 14 elements critical to long-term health, growth, and coloration of aquatic plants. growth of tropical aquatic plants. re-establish concentrations in aquaria following large water changes. Also provides 0.001% iodine to enable crustaceans (such as shrimp) to molt and grow. Potassium - Protein synthesis, water and charge balance, enzyme activation. Boron - Chlorophyll production, flowering, root growth, cell function. Carbon - Required for all organic compounds. Calcium - Cell wall stability and permeability, enzyme activation, cell response to stimuli. Chlorine - Water and charge balance, photosynthesis. Copper - Component of enzymes utilized in redox reactions that take place during photosynthesis. Iron - Required for photosynthesis, component of enzymes utilized in redox reactions. Magnesium - Component of chlorophyll, enzyme activation. Manganese - Formation of amino acids, enzyme activation. Molybdenum and Cobalt - Required for nitrate reduction. Nickel - Enzyme activation, processing of nitrogenous material. Sulfur - Component of proteins and the coenzymes that are involved with nutrient utilization and growth. Zinc - Chlorophyll production, enzyme activation. Note that Oxygen and Hydrogen are also required, but are available at all times through water, and so are not included in the list of components that comprise this solution. FlorinMulti does not contain phosphorus or nitrogen; our extensive experience with planted aquarium husbandry has led us to believe that these nutrients should be added directly if/when desired by the hobbyist in accordance with plant needs, rather than in a broad spectrum nutrient solution.